Roasted potatoes, baked to perfection! 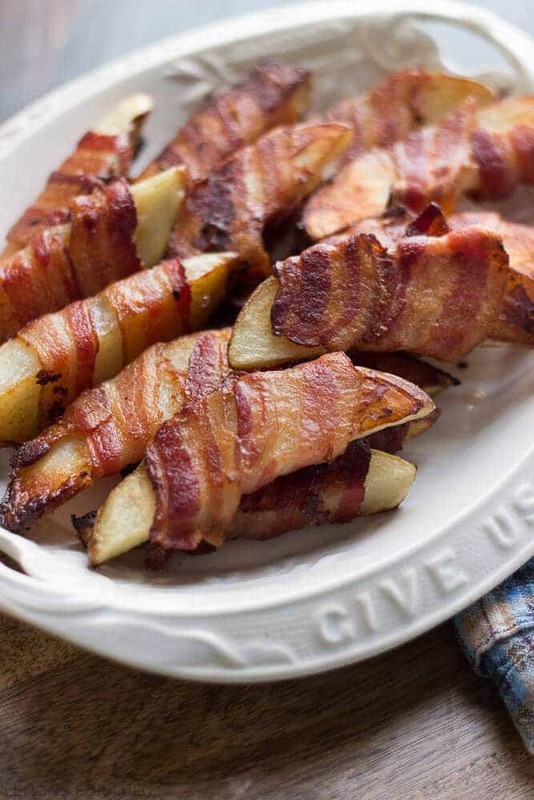 When wrapped with bacon, the potatoes become crispy on the outside and tender on the inside. 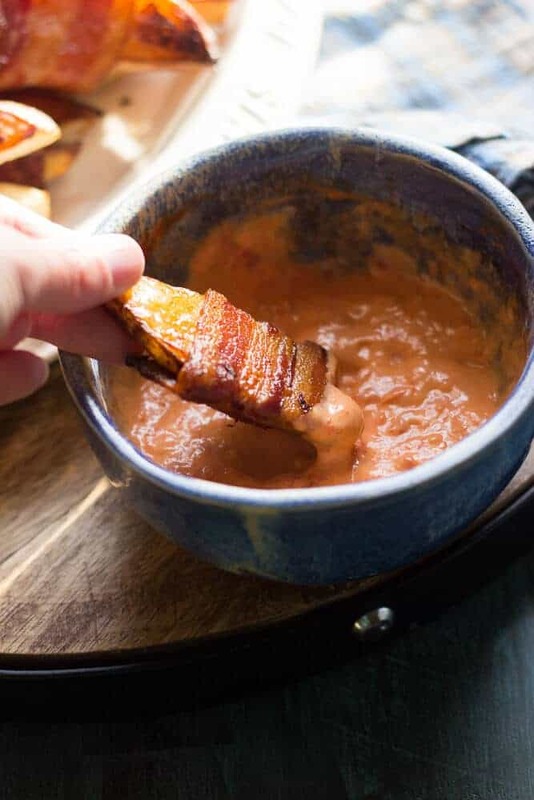 Serve with a delicious harissa aioli for a fantastic appetizer. I’ve never met a french fry I didn’t like. Really, I hardly ever discriminate when it comes to those hot, golden, crispy spuds. I like them crinkled, curly, straight or in wedges. My only requirements are that they are crispy and that they are hot. I don’t often make fried food at home, which means if I want to indulge in fried potatoes I’ll have to go to a restaurant. The problem with going to restaurants is I’m sort of cheap. My motto is, don’t pay for food when I can just as easily make better food at home. I know I can make Irish Nachos and a Loaded Potatoes recipe better than any restaurant. 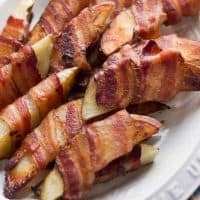 My kids probably hate my motto, but that will change after they try these bacon wrapped roasted potatoes. These roasted potatoes are the ace up my sleeve so to speak. My family may never want restaurant potatoes again. I’m a huge fan of oven roasted potatoes. I love being able to control the flavor and the sodium of my potatoes. Not to mention, I prefer to cook with olive oil. I also love to cook with bacon. I make candy bacon for pancakes, use it as a topping for my pasta, and bake it into biscuits. Bacon is a gift from above. And since bacon and potatoes go together like peanut butter and chocolate, I felt perfectly justified roasting my potatoes with bacon! I recently read the key to crispy roasted potatoes is to allow them to soak in water for about 30 minutes. Potatoes naturally contain quite a bit of water. And soaking them removes the starch, reducing the amount of water in the potatoes. If your potatoes contain less water, less steam will be released during the roasting process. Brilliant, huh? After the potatoes had a chance to soak, I drained them and patted them dry. A drizzle of olive oil and a sprinkling of salt finished them off. I chose the light olive oil because I didn’t want anything heavier or stronger to counteract the taste of the bacon. I wanted each bite of these roasted potatoes to make a bold, crispy statement. The extra light tasting olive oil has a delicate flavor that is perfect for sautéing veggies or even in baking. 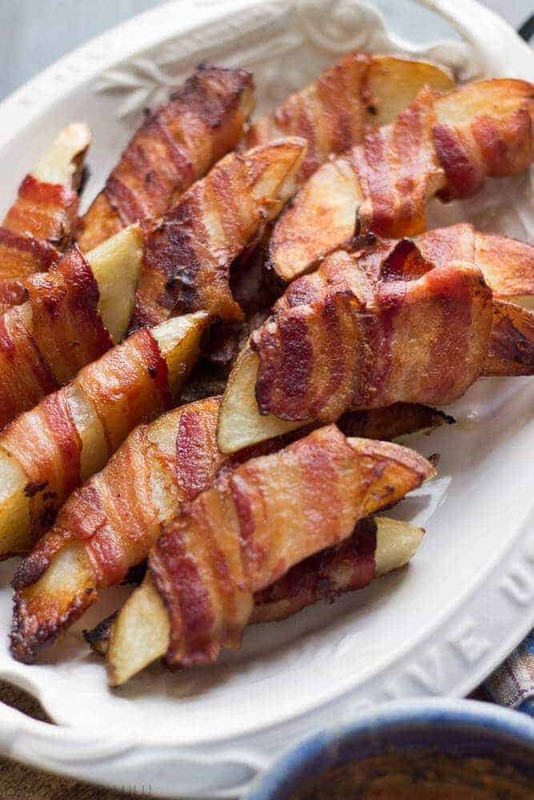 The taste of these bacon wrapped roasted potatoes is unbelievable!! I chose to serve them as an appetizer with a spicy aioli, but they would be fine served as a side dish. The pre soak really makes a potato that is tender on the inside and of course the bacon makes a very crispy, flavorful exterior. Making aioli is simple: mayonnaise, Harissa and garlic. Harissa is a spicy, North African pepper paste. You can find it in the middle eastern section of your grocery store, although I ordered mine on Amazon. If you cannot find this or prefer not to look, don’t worry. An alternative would be to puree jarred roasted red peppers in your food processor along with chili flakes and paprika or even a few dashes of hot sauce. Naturally you can leave out the aioli altogether. The roasted potatoes really do shine on their own! 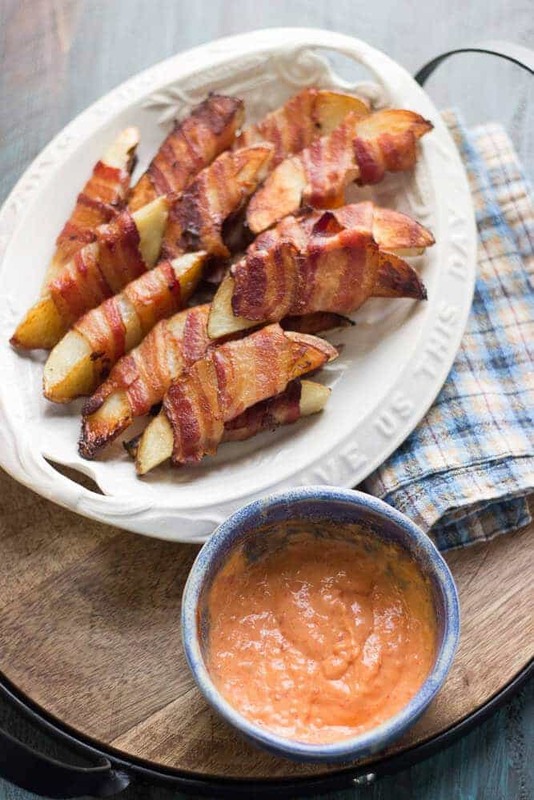 Bacon helps these oven roasted potates crisp up to perfection! 2 tablespoons Harissa (I used spicy). This is often found in the Indian or Middle Eastern section of your store. 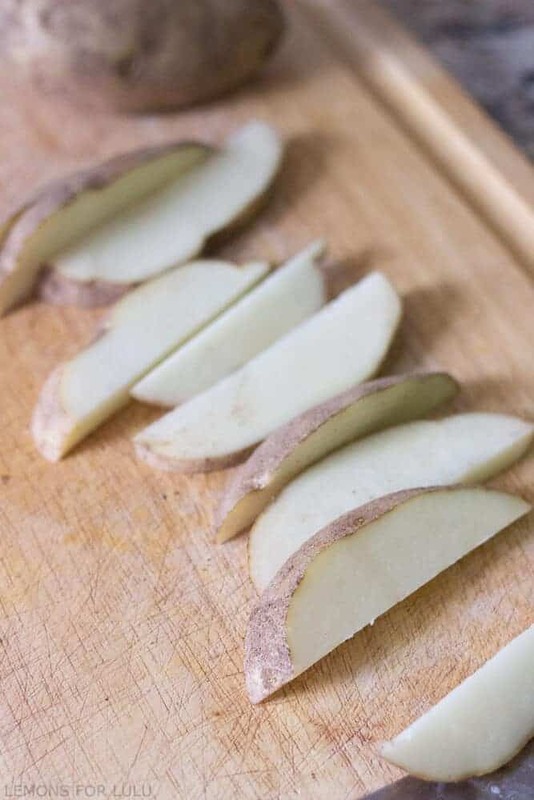 Slice each potato in half. Cut halves into quarters. Slice quarters into 1/2 in slices. Soak potatoes in water for 30 minutes. When finished, drain water and pat potatoes dry. Drizzle olive oil over potatoes. Sprinkle potatoes with salt and lightly toss. Preheat oven to 350. Lightly spray a baking sheet with non stick spray. 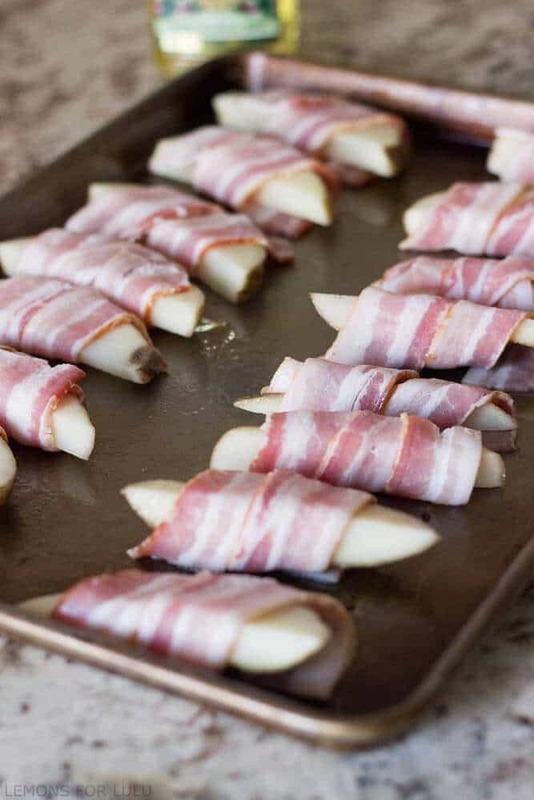 Wrap one slice of bacon around each potatoe wedge and place on your baking sheet. Arrange potatoes in an even layer. Bake for 40 minutes, turning potatoes over half way through bake time. For the aioli: combine mayo, Harissa and garlic in a bowl. Serve with potatoes. *If you cannot find Harissa, use 1 jarred roasted red pepper, pureed. Combine pepper with mayo, 1/4-1/2 teaspoon chili pepper flakes and garlic. YES to everything about this dish. You can never go wrong with the combination of bacon and potato.. .and I can imagine that the harissa aioli just tates so delicious too. A recipe I need to try! Yes please!!!!! Love the dipping sauce with this 🙂 pinned! All lovely recipes. Thanks so much. Happy Holidays to you and your family. Thank you for reading Liza! Happy Holidays to your family as well! I’ll bet these would be a huge hit around my house! Such a delicious treat! I’m going to. have to try these soon! A wonderful appetizer idea to try out!